Did you know that Vitamin C can save your face and your body? Today, I’m going to show you how to make your own all-natural, DIY Vitamin C Anti-Aging Serum for clear & glowy skin. Vitamin C is one of the view ingredients that’s been proven to repair sun damage and build collagen. But don’t buy a Vitamin C serum from the store – Vitamin C breaks down when it’s exposed to light. 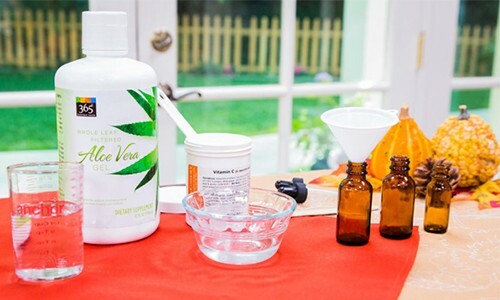 You want it fresh and made at home, with this DIY Anti-Aging Vitamin C Serum. Measure out ingredients into a bowl and mix. Sterilize an opaque dropper bottle in boiling water. Use a funnel to pour ingredients into bottle. Fill dropper and dispense into clean hands. Rub together and massage onto clean face and neck. Make this DIY Anti-Aging Vitamin C Serum weekly for optimal freshness. I’ve made lots of other Vitamin C DIYs, here are a few links if you want to explore! And if you don’t have time to make your own Vitamin C serum, check out this awesome alternative from goPure Naturals. Share with your friends & followers! Grab My Brand New Starter Guide for FREE today!! © 2019 Sophie Uliano. All Rights Reserved.